This girl performance tech quarter 6 pair pack has great features: half cushion foot & mesh for breathability! Only sizes Infant & Toddler have no-slip nonskids (shown in image). Sizes XS, S, M & L do not have nonskids. 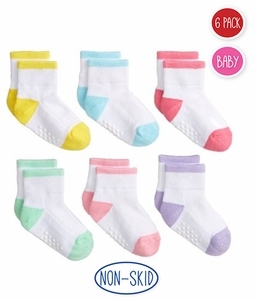 Price shown contains 6 pair. You get one pair of each pattern shown.